Beautiful spring weather for another great training race. The first race of the season is always nerve wracking to see how the fitness is progressing over the winter and to see how well the team is working together. I was happy with both for this race — my fitness seems on track, and everybody on the team worked hard and played important roles in the race. The win went to a strong competitor, Travis Sherman, who showed that his form is excellent by powering a two-man breakaway to the finish and taking the win by probably close to 5 minutes. Ed Whitehorn showed that he has carried excellent fitness through the winter and helped Travis and finished a strong second. I had two teammates in the initial breakaway so I helped block for the first couple of laps covering moves by Alabama Masters to get somebody across to the break. But the pace proved a bit much for my teammates and both got dropped from the break. So we established a chase group that motored along for three laps but not making much ground on Travis and Ed. With the help of my teammates Wes and Mike, I edge out Pat Allison in the sprint for third place. Heartrate/Power data for the race annotated at the interesting spots. The final sprint … new personal maximum 5 second power of 990 watts registered on the Polar power meter. This entry was posted in Racing, Training and tagged heartrate, power, road race on February 22, 2010 by kartoone. The predicted snow materialized, and I got to enjoy a nice long commute home in the snow. It was sleeting pretty heavily mixed with the snowflakes so some of the downhills stung as the sleet bounced off your face. 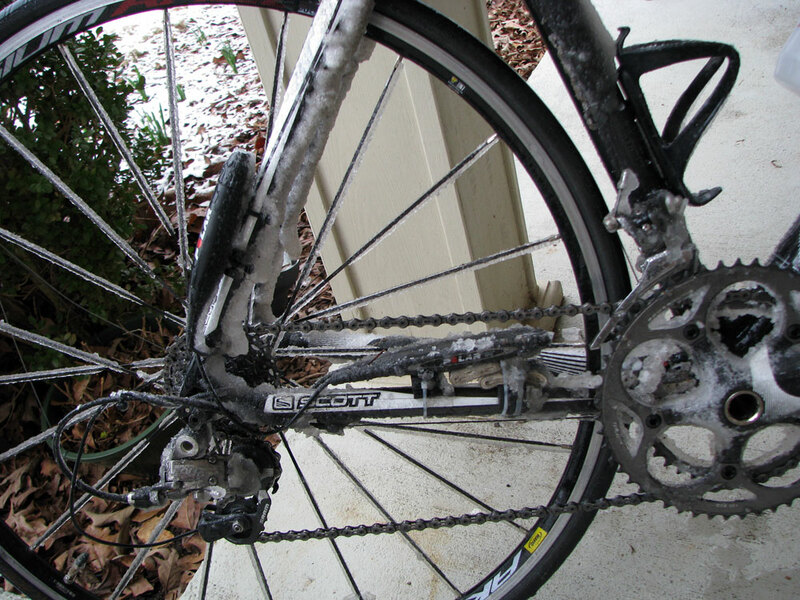 Check out the pics of me and my bike after the ride home… lovin’ it! Amazing that even with all the ice, snow, and water on the battery pack, the magnet, and the head unit – the power meter still worked great! For all you Polar Powermeter experts I know that I need to raise the back end of the meter up – I just haven’t gotten around to doing it yet. The only consequence at this point is that it reads too high when there is very little pressure on the chain. Otherwise, the readings are very consistent which is certainly what you are looking for in any good power meter. The ride definitely started out fun and beautiful, but I was pretty cold and VERY wet by the end of the ride! The red in my face is probably from all the sleet bouncing off of it! Check out the accumulation of snow on my gloves. 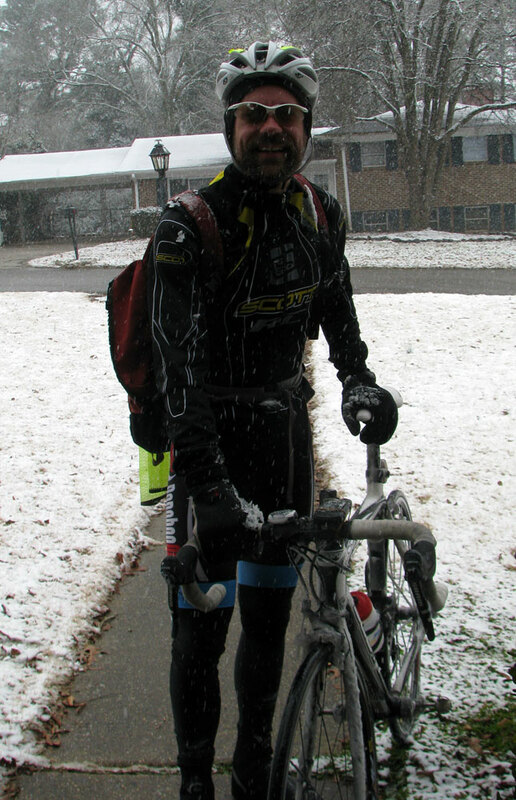 This entry was posted in Training and tagged commute, photos, snow on February 12, 2010 by kartoone.